Father Cuthbert O'Gara C.P. with Sisters of Charity, Chenzhou, West Hunan. Mid-1920s. This article originally appeared in Information Update, Weinberg Memorial Library's newsletter. Read it here. The Heritage Room is hosting an exhibit on art and artifacts from the Passionist China Collection, honoring the 90th anniversary of the deaths of Passionist missionaries to China Fathers Walther Coveyou, Godfrey Holbein and Clement Seybold. The Weinberg Memorial Library has been home to the Passionist China Collections since August 2016 and to the Passionist Historical Archives since 2012. In the 1920s, Passionist missionaries went to convert the Chinese. 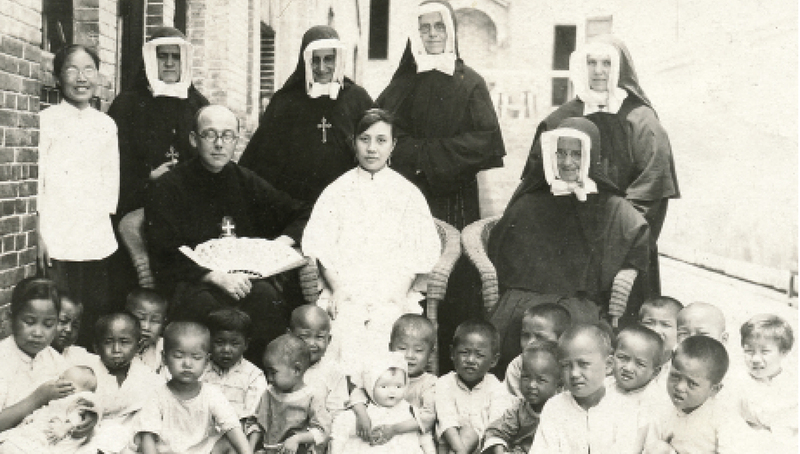 Throughout the 20th century, missionaries and Chinese Catholics were witnesses to suffering and hope. The 1929 murder of Fathers Coveyou, Holbein and Seybold by Chinese bandits was a moment of profound and sudden grief. At the time, the willingness of these missionaries to shed their blood also inspired faith for Catholics in and beyond China. In the exhibit, titled “Life, Death and Memory: Art and Artifacts from the Passionist China Collection,” portraits of Fathers Coveyou, Holbein and Seybold will be on display along with personal mementos, documents and scrapbooks from the 1920s. Respect for Chinese culture comes alive when viewing a painting by 20th-century Chinese artist Luke Chen and a Hunan wood carving. Visiting the Passionist China Collection exhibit offers us a story of China suffering in the past, teaches us the value of cultural reconciliation and inspires us to live our future with faith. The exhibit will be on display during the spring semester, closing Wednesday, April 24.